Built by the Publix Theater division of Paramount Studios. This movie palace opened on December 26th, 1927. 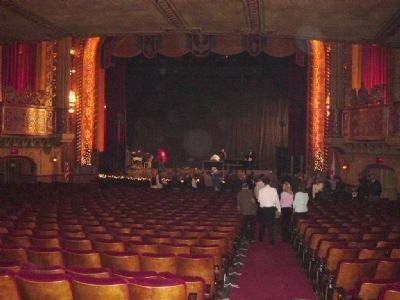 The theatre, in Spanish / Moorish design by Graven and Mayger of Chicago, seated 2500 in a five story, three-tiered auditorium. 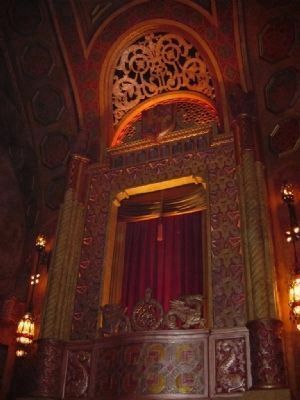 Paramount's president, Adolph Zukor, named it the "Showplace Of The South". 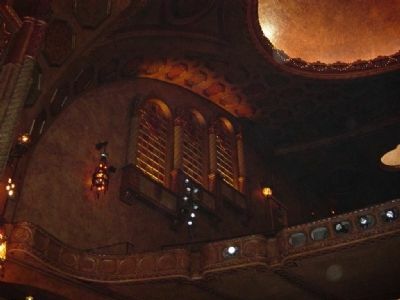 The famous "Mighty Wurlitzer" pipe organ, with 21 sets of pipes, was played for many years by showman Stanleigh Malotte. 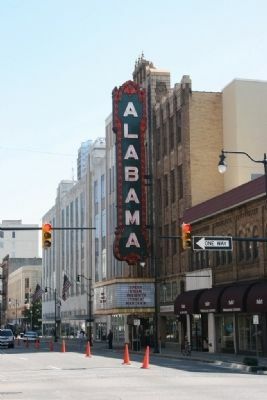 The Alabama hosted many events including the Miss Alabama Pageant and the Mickey Mouse Club. Closed in 1981, the magnificent old theatre was saved from demolition in 1987 by countless volunteers, organized as Birmingham Landmarks, Inc. 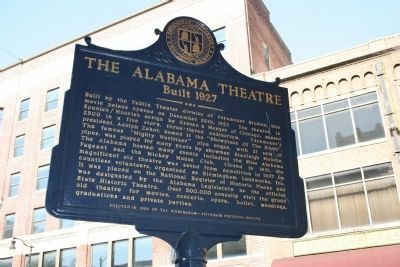 It was placed on the National Register of Historic Places and was designated by the Alabama Legislature as the official State Historic Theatre. Over 500,000 annually visit the grand old theatre for movies, concerts, opera, ballet, weddings, graduations and private parties. Erected 1998 by The Birmingham - Jefferson Historical Society. W. Marker is in Birmingham, Alabama, in Jefferson County. Marker is on 3rd Avenue North, on the right when traveling east. Touch for map. Marker is at or near this postal address: 1817 Third Avenue North, Birmingham AL 35203, United States of America. Touch for directions. Other nearby markers. At least 8 other markers are within walking distance of this marker. S. H. Kress Five-And-Ten Cent Store (about 300 feet away, measured in a direct line); Brock Drugs Building (about 500 feet away); Eddie James Kendrick (about 500 feet away); Civil Rights Freedom Riders (about 600 feet away); Green Acres Café (about 700 feet away); 4th Avenue District (about 700 feet away); Fourth Avenue Historic District. (about 700 feet away); Emory Overton Jackson (about 800 feet away). Touch for a list and map of all markers in Birmingham. More. 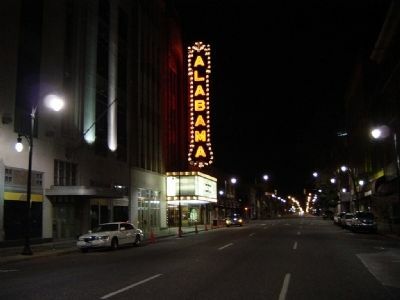 Search the internet for The Alabama Theatre. Credits. This page was last revised on June 16, 2016. This page originally submitted on February 7, 2010, by Timothy Carr of Birmingham, Alabama. This page has been viewed 1,749 times since then and 11 times this year. Last updated on February 9, 2010, by Timothy Carr of Birmingham, Alabama. This page was the Marker of the Week February 21, 2010. Photos: 1, 2, 3, 4, 5, 6. submitted on February 7, 2010, by Timothy Carr of Birmingham, Alabama. • Kevin W. was the editor who published this page.